Organized by Qingdao-based rail manufacturing company CRRC Qingdao Sifang Co Ltd, the sub-forum was designed to share experiences of technological development in China's high-speed railway equipment industry, boost technical exchanges and cooperation, and promote the application of international standards in different products. Global rail industry executives as well as top officials from related standardization institutions took part in the meeting. 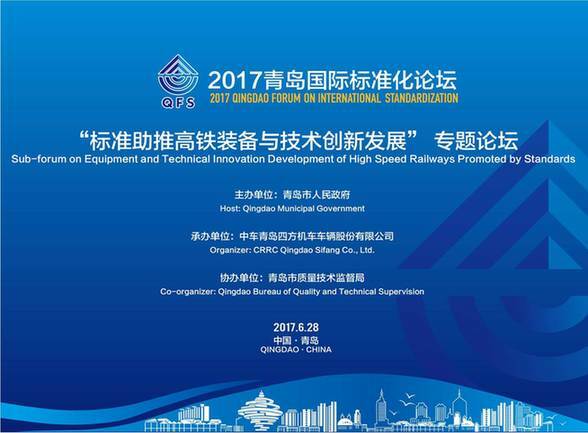 Liang Jianying, chief engineer of CRRC Sifang Co Ltd, introduced the general development situation of high-speed rail in China, as well as current development trends in equipment, technical innovation and industrial standardization, and the internationalization of Chinese high-speed rail equipment and technical standards. Kiyotaka Seki, secretary of ISO/TC 269/SC 3 (operations and services sub-committee of ISO/Technical Committee for railway applications) and deputy director of the Railway International Standards Center of Japan's Railway Technical Research Institute, Jean-Pierre Gilbert, former assistant secretary of the International Electrotechnical Commission of Technical Committee 9 for the Railway Sector (IEC TC9) and CEO of system engineering consultants Systexpert, Daniele Bozzolo, a senior consultant on railway transportation and former chairman of Cenelec TC9X, Stefano Guidi, security manager of Italian train operator Trenitalia and chairman of the UIC Standardization Platform, Dr Lars Lowenstein, a rail industry executive from Siemens, and Dr Jan Gopfert, a German expert on modulating and CEO of ID-Consult, delivered keynote speeches at the sub-forum and shared their areas of expertise. The event is expected to enhance exchanges between Chinese standardization organizations and their peers in different countries and regions and promote the internationalization of standards. Chinese high-speed train manufacturers are expected to learn about new advanced technologies and expertise from overseas high-speed rail equipment experts, which will help them strengthen their innovation capacity and competiveness.